Mulch is a beautiful thing, usually. Mulch is any type of material, either organic or inorganic, that is put atop soil in the garden or landscape to suppress weeds and conserve moisture. Generally speaking, it is one of the gardener’s most prized tools, but on occasion you may incur mulch problems in the garden. Mulch quality varies depending upon the type and/or supplier, either of which may create problems with mulch. First of all, too much of a good thing is just that — too much. Don’t pile too much mulch around the trunk or main stem; keep it a couple of inches away and no deeper than 3 inches to guard against potential crown rot diseases, slugs, and rodents that like to lodge in the pile. Using mulch in gardens to excess may also encourage the plant to root in the mulch and not in the soil, which will cause root decay, especially when the mulch dries out. Another garden mulch problem caused by thick application is possible fungi establishment, resulting in the creation of water repellent conditions. 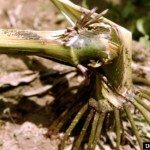 If this occurs, water is unable to penetrate the mulch and irrigate the plant. Conversely, using mulch in the garden too deeply may also do the reverse and allow the soil to become sodden, contributing to root rot and oxygen deprivation. An unscientific rule of thumb to discern if food is edible in the kitchen fridge is to take a whiff. The same idea works for mulch. When mulch is stored in huge piles for lengthy periods, problems with mulch may arise and you can usually smell them. When stored in this manner, the mulch undergoes anaerobic fermentation, which creates sulfides such as acetic acid, ethanol, and methanol. 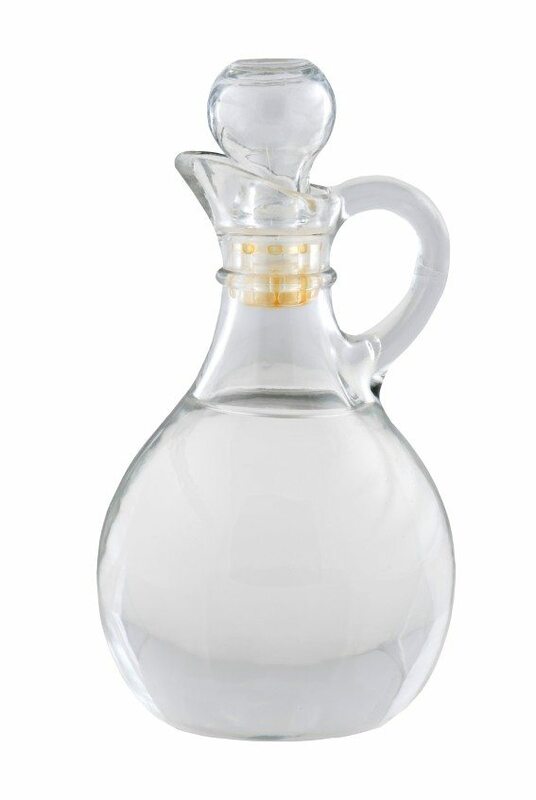 These odiferous gases are toxic to plants, causing annual, perennial and shrub foliage to appear bleached or scorched. This garden mulch problem is referred to as wood alcohol syndrome or sour mulch and will smell of alcohol, rotten eggs or vinegar. This is generally a temporary condition with yellowing of leaves and wilted leaves on woody plants, indicating the resultant nitrogen deficiency. To combat this potential mulch problem in the garden, add a nitrogen source like blood meal or high nitrogen fertilizer before spreading your mulch. You should also water sour mulch and spread it out to dry for a few days at which time it is safe to use. 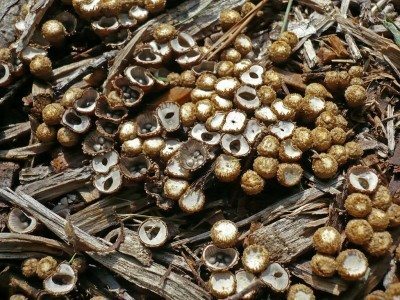 Bird’s nest fungi and Artillery fungi may grow in mulch. They are decay organisms; both propagate via spores. Artillery fungi are tiny, cream or orange-brown cup-like structures which shoot their spores and attach to any surface they hit, leaving black spots on foliage and home or deck siding that is hard to remove. 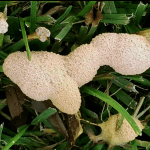 Slime molds are another example of a mulch issue; however, they are not a serious problem and may even be decorative with their brilliant yellows and orange tones. Lastly, some commercial mulch companies use recycled woods and add coloring to them to sell for landscape purposes. They decompose much faster than natural mulch and may contain toxic ingredients that can affect plants, pets and children.